There can be a cost to doing a job too well. At its core, a stormwater basin only needs to absorb and slowly release excess runoff, and need not be pretty, attractive or biodiverse. To be as valuable an asset to the community as possible, however, it needs to be all of these things, and it is our job as pond managers to make these facilities function both as stormwater retention devices and as idyllic natural settings. While a well-maintained stormwater pond may indeed also be a beautiful habitat for wildlife and an aesthetic pleasure, it still poses certain hazards that pet owners should be aware of. Any natural setting contains certain dangers that pet owners need to mitigate when enjoying time outdoors with their dog, especially when bodies of water are involved. 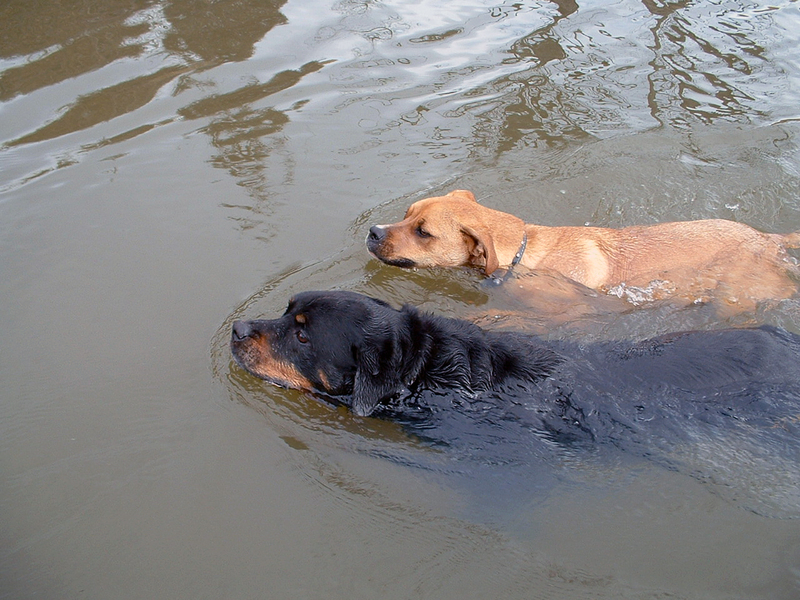 Water may be deeper than expected and even strong swimming dogs can be imperiled by strong currents. Debris may also be hidden beneath the surface that can injure or entangle a swimming pooch. A pond designed for stormwater maintenance may also include drains and underwater structures that could pose additional hazards. These drains can be especially dangerous as draining water may be too swift to swim against, and may pull your dog under. Storm-swollen ponds are going to be particularly turbulent as water is rushing in from the neighborhood and out through the drainage structures. While your pond may be beautiful, it is best to save the swimming for the beach or an area set aside for safe dog swimming, like a retriever training area. It is also best not to treat your pond as a giant water dish while taking Fido for a walk. Human-caused pollutants like spilled automotive chemicals and residential pesticides are one concern, but a more likely danger is coliform bacteria. High populations of Canada geese in suburban neighborhoods mean that the ponds frequented by waterfowl and areas downstream of dropping-laden fields are likely to have dangerously high coliform bacteria counts, and should not be treated as potable, even for your pets. True, wildlife drink from these ponds all the time, but domestic pets do not have the constitution of wild animals, and if their digestive systems are irritated by contaminated water, guess who gets stuck scrubbing the carpets? You do. So if you think your dog might need a drink during your stroll around the pond, bring a water bottle. Female dogs can also develop urinary tract infections from exposure to contaminated water; one more reason not to let them swim in the storm basin. While we’re on the subject, it’s worth considering the wildlife that may be around the pond and the impact they may have on your pet’s health. First, ponds are often home to aquatic mammals like muskrats, nutria, beaver and other critters that swim in the water like frogs and ducks. If your dog is anything like mine, such a target may be irresistible, and an unleashed canine may charge headlong into the water in pursuit of this perceived invader. As previously discussed, this may create a dangerous situation in and of itself, and adding a frightened wild animal with claws and teeth into the mix does nothing to make it less so. Ponds are also attractive places for raccoons to visit, and raccoons are the country’s #1 vector of rabies. Good leash control and diligent maintenance of a vaccination schedule are vitally important to a dog’s health and safety in a natural area. Diseases other than rabies can be contracted when out in nature as well. Mosquitoes can carry heartworm, which if left untreated will be fatal to a dog. A more recent development is the increase in Lyme disease in the mid-Atlantic region. The exclusion of natural predators and hunters from residential areas has led to an explosion in the deer population, which has, in turn, led to high numbers of disease-vectoring ticks. Your pond is a water source for wildlife, and the vegetation around it a source of food and cover, meaning that deer will frequent that area more than others and the risk of picking up a tick is increased. Lyme can be fatal to dogs, so please consult your veterinarian about Lyme vaccines to protect your canine companion as well as flea and tick treatments and heartworm preventative medication. You may have noticed that in this discussion about pets I have only talked about dogs. Cats are also prone to the same hazards around a pond, and should also be vaccinated against rabies and other transmissible diseases, protected by flea and tick prevention, and kept away from wild animals and hazardous areas. Unlike with a leashed dog, this is very difficult to achieve with a cat, and so, if you’ll excuse my soapboxing for a minute, cats should live inside. There is an environmentalist argument for this, in that free-ranging housecats kill billions of native songbirds and small mammals every year, but it is also for the cat’s own good. While it is true that large predators are unlikely to be in your neighborhood, we do have plenty of foxes, owls, hawks, and even coyotes in some areas. I have personally found cat bones in owl pellets, tabby cat fur in coyote droppings, and once found a cat’s remains in a hawk’s nest. I apologize for my stark tone, but when I find such evidence I am struck with the thought that this may have been some child’s pet and only wish to prevent future incidents. The only way to keep your cats safe from teeth and talons is to keep them inside. If you give in to their desire to roam free, you must be aware that someday they may not come back. Please do not let me frighten you away from enjoying the natural beauty of your neighborhood pond or other green space. Nature is indeed a joy to experience for us and for our pets. One needs to recognize that nature also demands respect, and that remembering our boundaries maintains safety for ourselves, our pets and our wild neighbors. In my experience, this respect and appreciation of the independence of nature makes time afield all the more enjoyable, and I wish only the same for you. Have fun, and stay safe. Gavin Ferris is an Ecologist with SOLitude Lake Management. Since 1998, SOLitude Lake Management has been committed to providing full service lake and pond management services that improve water quality, preserve natural resources, and reduce our environmental footprint. Services are available throughout the Eastern United States. Fisheries management consulting and aquatic products are available nationwide. Learn more about SOLitude Lake Management and purchase products at www.solitudelakemanagement.com.